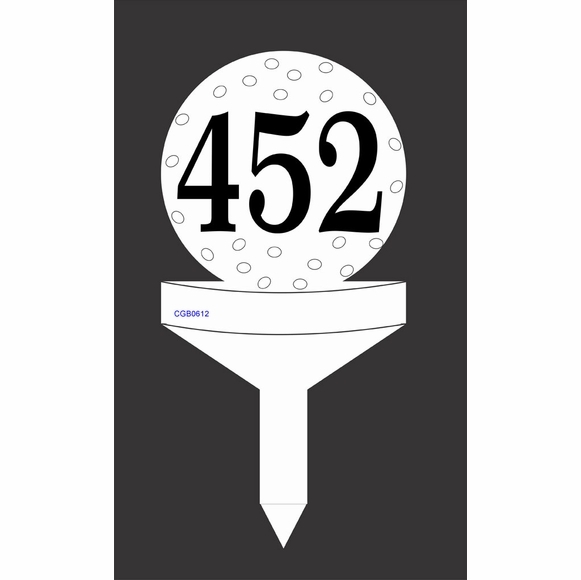 Golf Ball Shape Address Sign - - Personalized Golf Ball on Tee shaped sign custom made for you. One-line lawn sign displays the address numbers you specify. Made in USA. The golf tee itself serves as a self-stake, making it easy to insert the sign into your lawn or grounds. One-of-a-kind golfer's address sign includes your house numbers or letters. Can hold up to three (3) 3" characters or two (2) 4" characters. Shape: round golf ball sitting on a golf tee. There is no background color. Tee is approximately 6" long and provides a leg to stick into the ground or lawn as a self stake. Personalized Golf Ball on Tee shaped sign custom made address sign. Made in USA. The golf tee itself serves as a self stake, making it easy to insert the sign into your lawn or grounds.